HAYWARD, Calif., Feb. 12, 2019 /PRNewswire/ -- Virtual Visions announced today the formal launch of the retail industry's first integrated technology platform for creating smarter physical stores. Leveraging customized smart displays that are intelligently integrated with inventory systems, the platform enables retailers to create smarter, more engaging and, ultimately, more profitable stores. Retailers everywhere are looking to intelligently manage their physical footprint, one of their costliest -- and riskiest -- investments. With the Virtual Visions Smartstore Platform, the company is empowering retailers to reimagine their stores with a smarter physical footprint -- whatever the size -- and with potentially limitless inventory available via the Cloud. Virtual Visions smart displays and inventory management system completely transforms brick-and-mortar stores from cost centers to profit makers. One of the biggest barriers standing between retailers realizing profits faster is the ability to identify the most sought-after merchandise. Too often stores are dedicating valuable retail space to less popular items. Meanwhile, customers are leaving empty handed not being able to find the items they want to buy. Advanced software-driven smart displays to enhance the in-store experience. Virtual Visions helps merchants deliver a customized in-store experience using digital displays with self-service capabilities for customers to easily access products saved to their wish lists on social media, merchandise information, pricing matching and the ability to research items at nearby stores or online. New levels of intelligence built in to improve operations. Virtual Visions can quickly integrate with any inventory or CRM system to ensure that merchants are never out of stock. The next-generation or break through intelligence built into the system helps shoppers find the product they want to buy in the right size and color. Seamless inventory tracking. RFID is used for inventory tracking and in-store product search to improve the in-store shopping experience while allowing merchants to stock best sellers. Virtual Visions Founder Almaz Nanjappa is an inventor and Silicon Valley veteran with a track-record of launching technology solutions for multi-billion dollar brands. Prior to Virtual Visions, Nanjappa founded Momentus that was later acquired by Softvision, a Cognizant company. Co-Founder Alex Grange is a digital media and signage expert serving more than 1,000 European merchants. Virtual Visions Chairman Amir Sarhangi recently sold his startup Jibe Mobile to Google. Together, CEO Mo Malek, Nanjappa, Grange and Sarhangi have assembled a team of leading B2B enterprise industry veterans in commerce, design, manufacturing and analytics from leading companies including eBay, Adobe, Google, Barnes & Noble, Toyota, Siemens, Bio-Rad and Continental Automotive. "In conversations with some one of the most forward-looking retailers today, we've discovered the need for physical stores to perform as intelligently as the world's leading e-commerce platforms," said Almaz Nanjappa, founder of Virtual Visions. "Many companies talk speculatively about the store of the future. At Virtual Visions, we are creating that store for our customers today." "A smartstore needs to provide customers with smart and elegant ways to discover what its right for them and make their choices easily available whether the items are inside the store, at another location nearby, or shippable to their homes," said Mo Malek, CEO. "But physical retailers have another opportunity: to more deeply engage the consumer in a way that is not achievable offline. The Virtual Visions platform kempowers retailers to customize and right-size the physical experience." As part of launching the intelligent digital displays, today marks the opening of the Silicon Valley Retail Innovation Lab in Hayward, Calif. The 10,000-square-foot facility provides retailers, quick serve restaurants (QSRs), and luxury brands a platform to redesign customer experiences transforming their storefronts to be more interactive and profitable with smartstore prototypes. 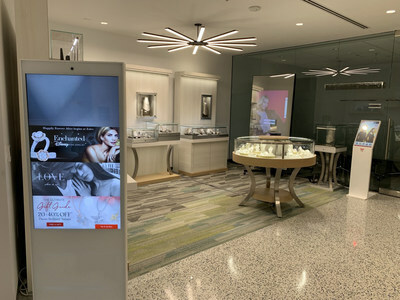 Since 2016, Virtual Visions has provided retailers, quick-serve restaurants and luxury brands with elegantly designed smart displays and a combination of break through hardware and software solutions that transforms physical locations into profit centers. Leading-edge smart displays enable customers to virtually navigate endless aisles of merchandise, while stores are able to optimize operations and creating a new retail economy. Virtual Visions is currently in use at more than 100 stores worldwide. Virtual Visions lab and center of innovation are located in Hayward, Calif.